Single 1-hp pump tucked neatly under a seat activates the hydraulic cylinders. 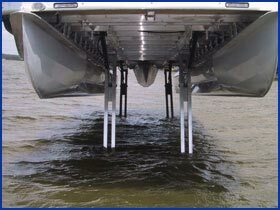 Retracted position, legs tuck neatly within 5 inches of pontoon deck; works with any pontoon trailer, no drag while in water. Total weight added to boat approximately 385 pounds, evenly distributed. No drifting, no anchors, no banging against the dock. 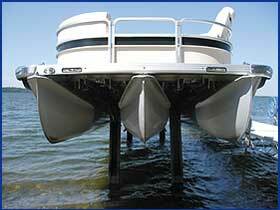 When not in use, Legs fold up to within 5 inches of pontoon deck, for normal operation in the water or on any pontoon trailer. 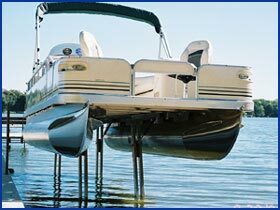 Sea Legs attach permanently to your boat so you can take your lift with you wherever you go! Four heavy duty hydraulically operated lift modules provide up to 7500 pounds of lift capacity. Four large 31-inch X 8-inch pads provide maximum support on any lake bottom. Single 1.5 horse power pump tucked neatly under a seat controls the hydraulic cylinders. Lift height approximately 6 feet, measured from bottom of boat deck to lake bottom. 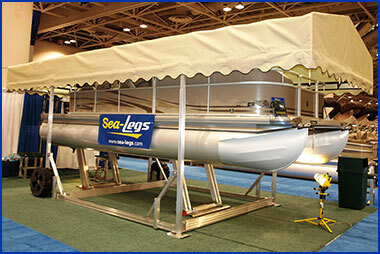 Triple tube Sea-Legs are designed to always have two modules running at all times.